In the fitness world today so much emphasis is put on our routine, its volume, frequency, full range of motion, going to failure, nutrition, calorie counting and getting all of our micronutrients. There is one area of training that is still neglected and it comes in the form of recovery and warm-ups, to be more specific, stretching. It is on a daily basis that I see gym bros walk into the gym, load 200 lbs onto the bench press and without even rotating their arms or doing a push-up start their working sets. Whether it be a lack of knowledge or that they feel embarrassed about benching just the bar or a low weight to warm up, this is a mistake that needs to stop now. On the other end of the spectrum there are individuals who static stretch all the muscles they will be working before they even touch a weight. Again, this is a practice that needs to be stopped for the good of the individual. This article will be dedicated to teach you how to do proper warm up and cool down stretches that everybody should be doing as often as they train (or even daily). Dynamic stretching always involves constant motion with the main purpose of warming up your body to get ready for lifting. Dynamics are extremely useful for preventing injuries. When anybody walks into the gym, more than likely their muscles are stiff and cold from either sitting at work all day or just waking up. We don’t want this, because a stiff muscle is a muscle that doesn’t want to be strained or contracted. What this means for the individual that starts his bench routine with 200 lbs on the bar is a restricted range of motion, as tight muscles will be over compensated by antagonist muscles leading to an increased risk of injury. 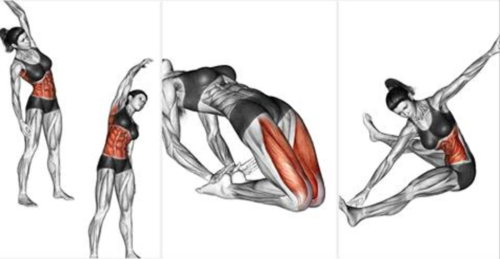 Many, many more exist but those are just some examples to help warm up your body before lifting weight. After doing two to three sets of 15 to 20 reps you will most likely feel more limber and more fluid when warming up under the bar. Although it’s not stretching, another mistake many make is starting too heavy with their compound lifts. If you are doing five sets of five reps (5×5) with a certain weight, don’t start with that weight for a few reasons. As mentioned, your muscles are not properly prepped (even with dynamic stretching), and will be more likely to cause injury. By starting with less than 50% of your max weight (something you can get for 20 reps easily) you will be letting your central nervous system know what’s going on without overloading it. Most fear that they will pre-fatigue their muscles if they include too many warm up sets, which can happen, but this is easy to avoid. For example, if you’re going to be doing a 5×5 of bench press at 200 pounds for your working weight, start with just the bar or the bar with an added 10-15 pounds on each side (totaling around 65-75 pounds) and do between 10-20 reps, this weight should feel like air and you should be able to do another set right away. Immediately add 25-35 pounds on each side (totaling around 90-110 pounds) and do 3-5 reps with strict form. Now you can add a 45 pound plate and a 10 on each side (totaling around 150-155 pounds) for another 3-5 reps. Finally you can either do another warm up set with a 45 pound plate and a 25 on each side (185 pounds) or rest a few minutes and start your first set of 200 depending on how you feel. Changing the weight to whatever your working sets will be (whether it is 95 pounds or 315 pounds) you should’ve been able to add weight and do every set with almost no rest between. And believe it or not, you will be stronger on your working sets because all the warm up sets did was prep the CNS for heavy weight and not going close to failure means you wasted very little energy warming up. So the next time you’re squatting, benching or deadlifting (you should be doing at least one of these every workout if you’re goal is strength and/or size) try this warm up technique along with some dynamic stretching to prevent injury and feel stronger under/over the bar! The second big mistake that I see misinformed lifters do in the gym is hold various stretches before they begin their routine. Surprisingly, not only is static stretching useless before weightlifting, it can actually hinder strength and make injury more likely. This happens because when you stretch a muscle and hold the stretch, you are lengthening it and relaxing it. Just like trying to lift with cold muscles, static stretching with cold muscles results in a shorter range of motion as well as more pain. But let’s say you do a dynamic stretching routine and then do static stretching, would that be any better you might ask? Still the answer is no, even though you will be warmed up and ready to lift weights, static stretching will relax the muscle you will be trying to contract, therefore weakening said contraction. This would be like taking muscle relaxer medication and trying to lift weights (to a much less severe degree of course), your contractions wouldn’t be as strong and will be more likely to give out on you. This might not be a big deal when doing bicep curls, but when you’re doing 90% of your max on squats, you want your CNS and muscles warm, primed and ready to contract as hard as they possibly can, not cold and relaxed. The correct time to static stretch is after your workout. Whether it be right after you finish lifting, or ten hours later before you go to bed. Letting your muscles relax and lengthen after a workout will help increase blood flow, effectively letting nutrients into the muscle. This also helps reduce DOMS (delayed onset muscle soreness) in the following days after a hard lifting session. Stretching is most beneficial when done consistenly, as your mobility will slowly increase. You might even notice after a few weeks of daily full body stretching you can reach further or bend with less pain. This also helps decrease the chance of injury as better knee/elbow/back/shoulder mobility will make proper form that much easier on compound and isolation lifts. So next time you lift, dedicate 15-20 minutes sometime later that day to stretch all your muscles whether you worked them or not, holding each stretch for 30-60 seconds.